Kinesiology tape is the generic, non-branded term for elastic tape made of tightly woven elasticated cotton and nylon fibres. It is worn on skin in an effort to reduce pain, aid recovery, and improve movement. Kinesiology tape has enjoyed a meteoric rise in recent years. Many of the world’s top athletes have been seen wearing it, and it has become commonplace in most physical therapy and chiropractic clinics. As a result, a few myths about taping have emerged. I am going to put the record straight on the most common ones. But before I do, let me make clear my bias – I am a physical therapist and a tape fan. In fact, I like the stuff so much I bought shares in a tape company (RockTape) and now head up their professional education program in the UK and Europe. My experience of sticking tape on thousands of patients, running hundreds of taping workshops for health professionals, and taping myself whenever I hurt, is that tape works. It does cool and surprising stuff to reduce pain and improve movement. But I also hear a whole load of nonsense, misinformation, and misconceptions about kinesiology tape and what it does. Here are four most commons myths I hear, along with reasoning to the contrary. This myth comes from members of the public and health professional alike. I’m not going try to tell you there is an avalanche of high-quality evidence that forms an irrefutable case. That isn’t true of anything I do as a therapist, except perhaps suggesting people get up and move around a bit more. But there is a surprisingly large body of academic work studying tape. Although the research often isn’t as high quality as it might be and the results are sometimes conflicting, the overall theme is encouraging and positive. The most recent systematic review here found tape to be effective in reducing symptoms of pain that lasts for more than four weeks when used combined with exercise. Several randomly controlled trials have demonstrated the effectiveness of tape to reduce pain and improve function in a variety of conditions. This study showed that tape and exercise are as effective as an injection and exercise in managing patients with sub-acromial impingement of the shoulder. Also for impinged shoulders, this paper shows tape combined with exercise results in superior outcomes in pain, movement, and function than placebo taping and exercise. There are lots more studies. Plug “kinesio tape” or “kinesiology tape” into Pubmed or Google Scholar and take a look. You might be surprised. Sure, it’s not all one-way traffic. There are studies such as this one suggesting tape has little or no effect. However, like most of the studies with negative findings, they are testing tape on uninjured, unfatigued, and uncompromised subjects, so it’s no great surprise tape doesn’t do much in these cases. So, more high quality evidence is needed. But the statement “there is no evidence for taping” is scientifically refutable. Let’s all please stop saying it. It just ain’t. An element of how it works may be down to placebo effects, just like any treatment. But several studies like this and this have all compared a therapeutic kinesiology tape application with a placebo tape (either a different tape like micropore or a kinesiology tape put on with no stretch). 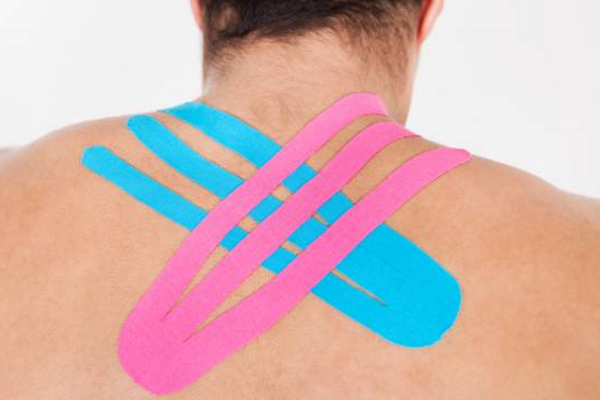 All these studies demonstrate the effects of kinesiology tape cannot be replicated by placebo taping. However, there are always flies in the ointment, like this study that found the placebo taping they used improved jump height just as much as the “therapeutic” taping. Perhaps this is just a good reminder that we have much to learn about how tape works, and how we can best use it alter variables like pain, mobility, and endurance. It doesn’t, but then it also kind of does. The myth I hear most is that pink tape will warm stuff up and blue tape will cool things down. This goes back to the history of tape being developed in Asia and picking up influence from color therapy. The theory is lighter colors reflect more heat while dark colors absorb more, thus altering tissue temperature under the tape. There are a couple of problems with that. Any change in temperature due to this mechanism would be infinitesimally small. And through homeostasis, the body is constantly adjusting blood flow to keep the proper temperature of our tissue regardless of environmental conditions. So, I respectfully suggest if you want to cool something down, try an ice pack. If you want to warm something up, try a heat pad or nice hot bath. But don’t sweat it over tape color. Stretch the tissue not the tape. Rub the tape all over to ensure a good bond between skin and tape. If you have a problem more complex than a bit of pain, tightness, or stiffness, seeing a good therapist with taping experience is probably time and money well spent. Kinesiology tape is a safe, effective, low-risk way to give your body a nudge in the right direction toward less pain and better function. It is not magic and it is not a replacement for rehab and sensible injury management. But if you’ve got a trouble spot, grab a roll, and give it a go. You can read all the articles and research papers you like, but the best way to understand what this stuff does is to feel it do its thing. 4. Anandkumar, S. et al., “Efficacy of kinesio taping on isokinetic quadriceps torque in knee osteoarthritis: a double blinded randomized controlled study.” Physiother Theory Pract. 2014 Aug;30(6):375-83. doi: 10.3109/09593985.2014.896963. Epub 2014 Mar 11. 5. Tamburella, F., et al., “Somatosensory inputs by application of KinesioTaping: effects on spasticity, balance, and gait in chronic spinal cord injury.” Physiother Theory Pract. 2014 Aug;30(6):375-83. doi: 10.3109/09593985.2014.896963. Epub 2014 Mar 11.